Alex Sonnenwald, an MBA student at top-ranked CUHK Business School, is interning in the strategy department at Tink Labs, one of the hottest Internet of Things (IoT) startups in Hong Kong. Having raised over $100 million, Tink Labs aims to be Hong Kong’s first unicorn startup. Its pioneer product, ‘handy’, is a revolutionary IoT solution for the hospitality industry—a free-to-use mobile phone for hotel guests which, in turn, provides hotels with valuable data on their customers. Alex, who’s working on handy, first heard about CUHK while studying business at undergraduate level in Germany. The school’s global focus stood out—CUHK boasts 6,600 MBA alumni spread across 40 countries. 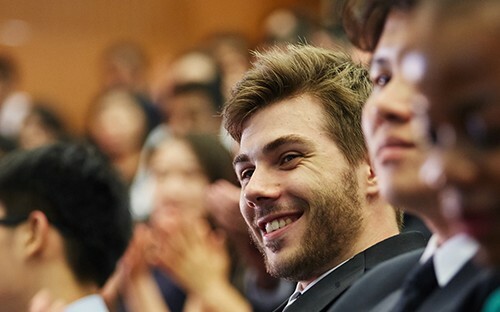 Alex had never travelled to Asia before he first stepped on-campus for the CUHK MBA—Hong Kong’s first MBA program. Now, he has the industry connections he needs to take his career forwards. BusinessBecause caught up with Alex to find out more. What can you tell us about your MBA internship at Tink Labs? I got the opportunity to learn SQL-based coding as part of my regular work schedule. Currently, I’m working on automating the data visualization dashboards I previously designed. I’ve also been performing research and Excel-based analyses to advise the senior management on diverse strategic topics spanning the organization. I’ve really enjoyed experiencing strategy consulting from an in-house perspective. Also, I’ve gained a better understanding of the startup work environment and how business is done in this part of the world. I’m currently looking into full-time strategy or operation-related roles in the technology industry, mainly in Hong Kong, Singapore, and the US. I feel like my time at Tink Labs, especially the coding-related projects, has definitely gotten me closer to where I want to be in the near future. Why did you decide to pursue an MBA at CUHK Business School? I was in the fortunate position of being able to choose from various MBA programs, including some in the US, Australia, and the UK. The high level of support provided by CUHK’s MBA staff definitely stood out. The MBA office offers great support with visa and housing applications so that minimal effort is required from the student’s side. Plus, the program is ranked among the best globally by the Financial Times. Various intensive courses are offered as part of the curriculum. These courses are usually three to five days long, highly practical, and provide an in-depth overview of one particular topic. I had the pleasure of doing Professor Haydn Pound’s Business Modelling course and, even though I was already quite familiar with the creation of Excel models, I was very surprised by the amount of progress our class made by the end of the third day. As part of the curriculum, professors also organize five-to-seven-day trips to selected locations including Singapore, Chile, Germany and the US (Silicon Valley). The trips provide students with the opportunity to connect with companies in the chosen region. Finally, through the mentorship program I was paired with the managing director for transformation at data storage firm Dell EMC, a Dell subsidiary. And it was my careers advisor at CUHK Business School who directed me towards the internship opportunity at Tink Labs.